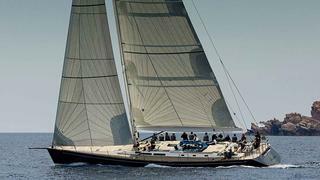 The 24 metre sailing yacht Whisper, listed for sale by Pegaso in Italy, has been sold to a direct client. Built in GRP by South African yard Southern Wind to a design by Reichel Pugh and launched in 2001 with a refit in 2010, Whisper is the first hull of the successful SW78 series. The general arrangement plan, deck layout and interior design are the work of Nauta Design. Accommodation on this yacht for sale is for seven guests in three cabins including a master suite, double stateroom and a twin plus a Pullman berth, all with en-suite bathroom facilities. In addition, there are quarters for three crew and the yacht offers plenty of storage space in all areas. Below decks, she features a classic teak-lined saloon with blue upholstery, a teak and holly floor and a white ceiling. The upper saloon provides room for a dining table for up to ten guests, plus a conversation area opposite with a projector for cinema quality television on a drop-down screen. In 2015 the blue leather upholstery was replaced by light cotton linen and he saloon also comes with a refrigerator and an icemaker. Ample deck space includes a large cockpit for al fresco dining and there are several areas available for sunbathing. Previously named Far Niente, she is a veteran on the regatta circuit, having won the Maxi Rolex cup in 2009 and finishing fifth out of a field of nearly 300 competing yachts in the Rolex Fastnet regatta. Under power, a single 230hp Yanmar engine gives her a cruising speed of nine knots. Whisper was asking €1,690,000 with VAT paid.